The more diverse a medical group, the more difficult it is to develop and maintain a sense of fairness in its income-distribution scheme. Radiology groups have historically been quite homogenous with everybody in the group doing pretty much the same thing. So it made perfect sense to pay each partner an equal share of the what’s left over after paying the bills. But Society of Interventional Radiology President Brian F. Stainken, MD, FSIR, notes that this “historic, homogenous model in which we all basically did the same thing is … well, history.” Leading radiology practices today have learned to embrace diversity and subspecialization. That builds a strong practice, but it can challenge the sense of fairness in the way various group members are paid. Differences in imaging modalities haven’t forced many groups to revisit their (typically) equal profit-distribution plans. After all, whether the radiologist is reading mammograms, MRIs, CT scans, or plain films, the business operation, revenue cycle, and facility requirements remain about the same. And with PACS, the group can somewhat address differences in demand and production between members by requiring cross-coverage: On a slow day the MRI physician can fill gaps in the schedule by reading plain films. At the same time, an IR physician sees different kinds of inequities. Stainken emphasizes that IR physicians have a much tougher work schedule than their diagnostic radiology partners and some of the most demanding call requirements of any specialty. While the diagnostic staff can switch over to the nighthawk service and head for home, the IR doctors must take turns covering night call at the hospital. Further complicating matters is the fact that IR physicians come out of training expecting to be paid more than their diagnostic radiology colleagues. According to the American Medical Group Association’s (AMGA) 2009 Compensation and Financial Survey, the median compensation for interventional radiologists ($478,000) was more than 9% higher than diagnostic radiologists’ average ($438,115). The difference in starting salaries was even greater, with IR doctors averaging 11.5% more ($435,000 vs. $390,000). So with differences like these, does it make sense for a radiology group to add interventionalists and expect to continue paying everyone the same by equally dividing profits? The answer is a resounding maybe. • The overall practice income is high enough for IR compensation to be competitive in the marketplace. • Noninterventionalists understand both the tangible and intangible value that IR doctors bring to the group and therefore embrace and support the services. • Financial reports clearly demonstrate that the IR program revenue covers its unique expenses and doesn’t have to be effectively subsidized by purely diagnostic imaging revenue. Along with these three critical factors, the group physicians must also have a sense that everyone’s working more or less as hard as the others, regardless of subspecialty. Tracking productivity (perhaps by work RVUs) and providing feedback to the physicians can add accountability and apply a little pressure to physicians to carry their fair share of the load. If this kind of pressure is just too subtle to have the desired effect, consider reserving a portion of the practice profits—say, 10%—to be redistributed as a production bonus. Incentive pay can make a big difference in some groups, but it can also contribute to division and dissension among the physicians, so proceed with caution. In the AMGA’s survey, interventionalists proved to be the fifth-highest-paid specialty in the country. This provides a real challenge for any organization wanting to recruit and expand its IR medical staff. A diagnostic radiology group that wants to add IR needs to understand from the outset that it’s making a large investment that could require two years to surpass the break-even point. When the IR recruits begin to ascend to partnership and participate in an equal-share income scheme, the entire practice profitability has to reach a level that will provide competitive incomes to help retain those physicians. A carefully planned and properly managed IR program can play a significant role in achieving that goal. Stainken notes that many diagnostic groups recognize IR’s importance and the need for its services, but they often don’t grasp its overall value and business potential. Interventional services add tremendous value to a group when talking hospital contracts. IR services have become so critical to a functional hospital, says Stainken, that “we tend to be the ‘glue’ that keeps contracts in place.” Hospitals want to contract with radiology groups who can bring IR to the table. Interventional radiologists frequently are among the top new admission referrers in their hospitals. Gregory M. Soares, MD, Rhode Island Hospital’s director of vascular and interventional radiology, sees IR as a potentially major asset in a diagnostic radiology group’s well-diversified service portfolio. Technological advances, open IT architecture, and high-speed data communications have conspired to increasingly commoditize diagnostic radiology, increasingly turning its services into a wholesale product traded on the cash market for the “right” price. A strong IR program can help minimize that threat by reconnecting radiologists with patients and strengthening relationships with referring physicians through participation in their patients’ care. These patient and referrer relationships remind the public that radiologists really are physicians who offer a wide range of clinical care and minimally invasive techniques to treat conditions with an alternative to open surgery. Skilled IR physicians with a great bedside manner attract patients to the practice both directly and indirectly through their referring physicians. In turn, interventional radiologists can produce a significant amount of internal referrals—sending their patients to their own partners for further imaging and to other departments or practices within a hospital or health system. Soares realized that within his own group there existed a general feeling that IR was valuable to the whole practice, but few could articulate that value or how much it benefited the group. So he and his colleagues launched a project to mine the existing data in their practice management system in search of evidence that would help quantify IR’s contribution to the practice. The study developed an algorithm based on procedure codes indicating an initial patient clinical contact with an IR physician. By following each patient who entered the system through IR, it was possible to track his or her care within the group, hospital, and related services. The end product provided an accurate approximation of IR’s top-line financial contribution to the group. When they considered evaluation and management services, hospital procedures, office procedures, and referrals within the group for additional diagnostic imaging, it became clear that IR’s financial contribution was substantial. In this group with nine interventionalists, the per-physician direct and indirect revenue was sufficient to create group support for expanding the IR program on financial basis alone. Revenue attributable to the office and freestanding suite was equal to or exceeded revenue generated at imaging centers of similar age. In an equal-share system, the financial reports provide evidence that everyone is contributing equitably to the organization’s financial health. They also show objective proof when a partner is lagging behind and not producing according to expectations. Black and white information is critical when partners practice in diverse specialties that generate income and utilize resources in very different ways. 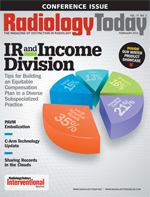 For radiology groups with different service lines, and especially those incorporating IR in the mix, the best way to track and report this kind of financial data is through a solid cost-accounting system that tracks revenue and expenses through various departments or “responsibility centers” within the larger organization. It accounts for every dollar earned by a given center and every dollar spent in support of the same center. Each department has its own bottom-line net profit, and the organization can evaluate its performance and make decisions based on financial facts. If management can provide timely one- or two-page summaries to all the partners, noninterventionalists can see for themselves the benefits of adding IR to a practice. If the IR department isn’t performing up to par, the group can investigate the reasons and address whatever obstacles are holding it back. As mentioned earlier, a medical group’s profit distribution scheme both reflects and reinforces the group’s culture. It says, “This is what we consider valuable enough to pay for.” Problems arise in multisubspecialty groups when the partners have no idea what they’re paying for in other departments. That’s why tracking and reporting on financial data is the key to success in developing and maintaining a profit-sharing plan that seems fair to all the partners. After all, as Stainken is fond of saying, “Fairness is an illusion. Certainly we should strive for it, but more important is a fair and thoughtful process.” The process must include not only robust data analysis but also a real commitment to mutual support of divergent specialties. The practice must allow IR physicians to focus on IR. When a group tacks on IR as an afterthought without providing the resources and time needed to cultivate a thriving IR practice, the results will be disappointing. Radiology groups today are wrestling with the twin pressures brought on by rising costs and flat or decreasing reimbursement. IR is on a different track. Continuing developments in minimally invasive interventions place the subspecialty in growth mode. A strong clinical IR program can provide what Soares calls a hedge against those declines in traditional revenue streams. — Timothy W. Boden, CMPE, is a Starkville, Miss., resident who has spent 22 years in practice management as an administrator, a consultant, a journalist, and a speaker. He has led medical groups of various specialties, authored or edited eight books and hundreds of articles on practice management, and made dozens of conference presentations.